Be more productive on the go with this sleek, stylish mouse that's comfortable wherever you work best. The compact, cordless design fits easily into a carrying case alongside your notebook, tablet or Ultrabook. 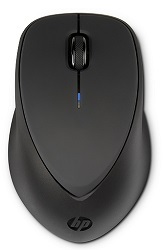 The mouse works seamlessly with Bluetooth-enabled laptops, Ultrabook PCs, and tablets without taking up a valuable USB port. A helpful LED indicator light verifies your connection and alerts you when the battery runs low. Nine-month battery life helps keep you working longer without interruption, and you can extend that even longer by turning the mouse off when it's not in use.